Jerry P. Gollub, Professor of Physics and John and Barbara Bush Professor of Natural Sciences at Haverford College, has been elected to the governing Council of the National Academy of Sciences. He was one of four scientists selected by members of the Academy in a national election. The National Academy of Sciences (NAS) is a private, non-profit, self-perpetuating society of distinguished scholars engaged in scientific and engineering research, dedicated to the furtherance of science and technology and to their use for the general welfare. The Academy's Council, composed of 12 members (councilors) and five officers, is responsible to the membership for the activities undertaken by the organization and for the corporate management of the National Academy of Sciences, which includes the National Academy of Engineering (NAE), the Institute of Medicine (IOM), and the National Research Council (NRC). Gollub has been a member of the Academy since 1993, and serves on the Steering Committee of the National Research Council Math/Science Partnerships Project. He previously served as co-chair of the NRC Committee on Programs for Advanced High School Science and Mathematics Education. From 1995-2000 he was a member of the Advisory Board of the National Science Resources Center, developers of primary school science curricula affiliated with the National Academy. A member of Haverford's faculty since 1970, Gollub has pioneered research in the fields of chaos and non-linear dynamics, fluid dynamics, and condensed matter physics. In 1984, he was selected as a fellow of the John Simon Guggenheim Foundation, and in 1985 he was the first recipient of the American Physical Society's Award for Research in an Undergraduate Institution. He won an international“Science for Art” Award in 1994. Gollub is also a fellow of the American Academy of Arts and Sciences and of the American Physical Society, and served on the latter's Executive Board from 2001-2002. 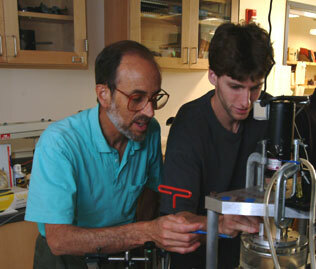 In addition to his teaching and research at Haverford, he is an adjunct professor of physics at the University of Pennsylvania. He received his bachelor's degree from Oberlin College in 1966 and his Ph.D. from Harvard University in 1971.